Haute by Jon Renau is a classic, mid-length, page style bob. It's timelessly chic and looks great on everyone. It's a very flattering style with a lot of versatility. - Bangs: 11.5”, Crown: 12.0”, Sides: 8.0”, Nape: 4.0"
Haute is a very popular addition to the Jon Renau Heat Defiant collection. This is a traditional page hairstyle that is universally flattering, and works well for any age. Jon Renau's HD fibers can be heat styled up to 350 degrees. Haute comes in a great length for everyday wear and she offers endless possiblitlies when it comes to looks. I ordered Haute after watching a few YouTube reviews and decided on the Chocolate Cherry color. I. LOVE. THIS. LOB! The length, the feel of the fibers, the color, the cap, the lace front, the mono part...all perfection. The ONLY downside to this wig is that she tangles very easily. I would definitely buy her again and in different colors too. She’s definitely one of my faves! 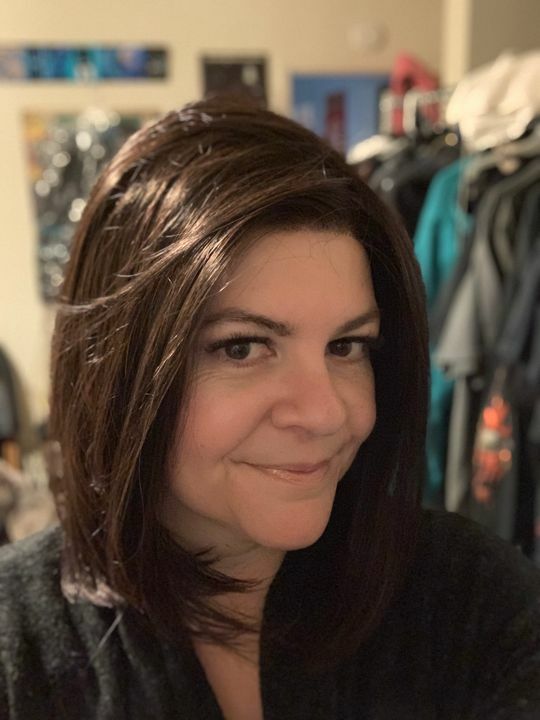 Linda N. Reviewed by Linda N.
This has become one of my favorite go to wigs! I took advantage of the heat friendly fibers and straightened it so the ends didn't go so far towards the face. My preference, but I like it better. The wig is very comfortable, great lace front and especially love the coverage on the ear tabs. Mine is in cherry creme, good but not as red as I expected. Could be a good thing because I wear it more than I would if it was very red! Also love the HD for the lack of shine, and it's short enough where tangling is not a problem. The wig itself is Very Pretty..... But definetly NOT on me. The videos are very decieving. 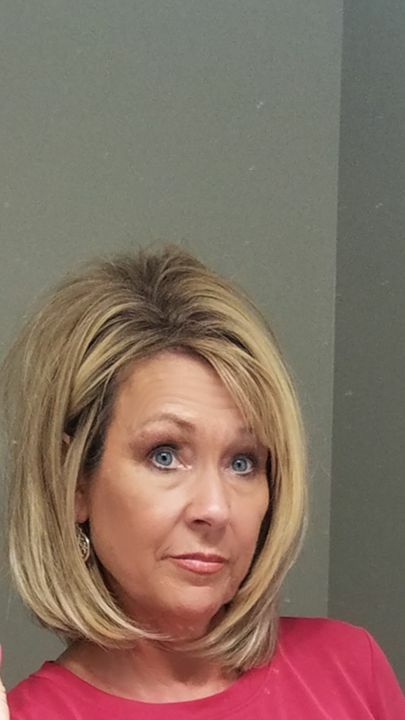 If you arent used to straight Flat hair.... forget this one. I thought I could pull it off......forget it you have to Keep in mind ... what looks Good on others May Not look good on you! This Jon Renaue Haute is Impossible to train to Stay out of your face. Very Annoying... even took her to my hairdresser to put a slight angled bang... No Luck ! I wish it could have worked. "Big Time" on this . Sad face. To expensive to risk buying before trying on. Kind of like ordering clothes on line. RISKY ! These things arent cheap Ladies ! And one more note. H.D. fibers and lace front..... no More! All brands of lace fronts in my personal opinion look Fake unless you are "Completly bald" with No hair line.....And the H.D. fiber wigs "DO NOT LAST"!!!!!!! My RW Crowd Pleaser lasted 8 weeks. Took veerrry good delicate care of her. Do No trust when they say heat freindly. They do not last after you put even a 300• heat to any of them. Never the same. Jenny Harris H. Reviewed by Jenny Harris H.
This was a very pretty sleek bob, just not right for my face shape. I did return it for an exchange, but I loved the color and wished I could wear this cut! Amber Visage M. Reviewed by Amber Visage M.
Very dissatisfied with the HD fiber on this wig. This was the 2nd Haute I ordered. The first was in the color Rootbeer Float which I returned for being too light brown for my liking. I noticed frizzed ends on it but hoped it was a fluke. Next, I ordered Salted Caramel because I've worn this color in toppers for 2 years. I'm familiar with how to care and style HD fibers but right out of the box the ends looked terrible . None of my toppers have ever looked that way new. Even though the price point is great on Haute, I don't think it should look anything but new when I open the box.